In previous posts, I’ve described the basic elements of QR codes and some ways that QR codes can be used in education and in workplace training. Free QR code generators and readers abound and some general QR code tools can be found in this resource collection I created using Trailmeme. You can also find more guidance about using QR codes on this tip sheet created by the Webbmedia Group. In addition to the uses I’ve described in previous posts, QR codes can be integrated into a larger instructional strategy that incorporates game play and storytelling. QR codes are a fun way to get learners to explore stories in non-traditional locations.This technique was used for two science fiction movies, District 9 and Inception (both great movies). QR codes on Inception posters led viewers with smartphones and QR code readers to a blog with teasers about the movie and the District 9 QR codes led viewers to movie trailers. Of course, the purpose here was to market the movies but you can easily use the same paradigm to connect learners to stories that require them to solve a problem. You can even require your learners to use location-specific resources to help guide them along a learning path. Learners can be required to text answers to a mystery question to a designated phone number provided when they read the QR code. 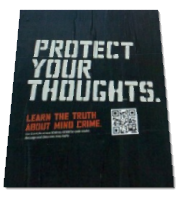 In other scenarios designed to promote learning, QR codes can be used as part of an Alternative Reality Game (ARG). Alternate reality games essentially enhance the real world with interactive media elements to create the narrative through which a story unfolds. 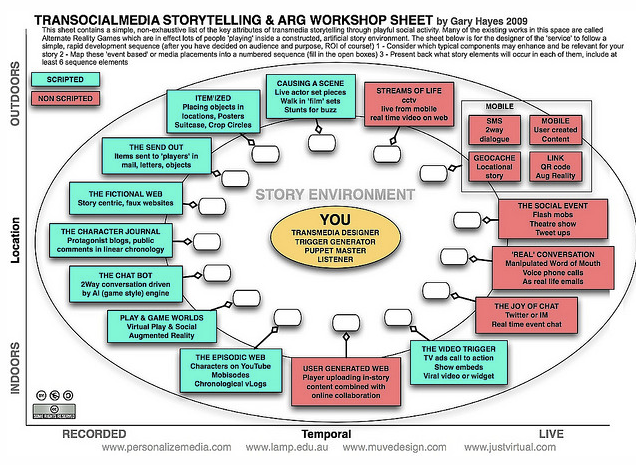 ARG implicates transmedia because more than one media type is typically used to reveal the story. It implicates social learning because teams of learners can be set upon the task of recovering clues and piecing the story and game elements together. QR codes can be used to define story context, to expose learners to characters’ points of view, and to guide discovery activities that may lead learners to the next story element(s). 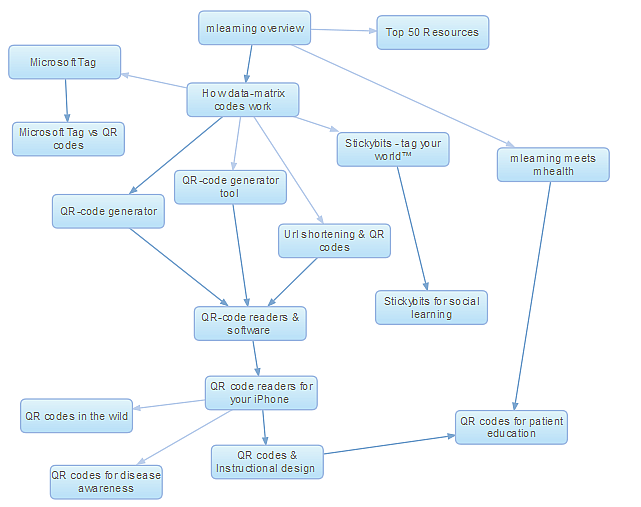 This great infographic by Gary Hayes illustrates how QR codes can be part of a larger, much more complex ARG effort. The ease with which learners can create QR codes and connect them to Web-based multimedia elements allows them to take a much more active role in storytelling. In one scenario, when a learner comes upon a QR code, she accesses a story via her smartphone and is invited to add a sentence or two to it and the next learner who comes upon it embellishes upon the growing storyline. In another scenario, when a learner comes upon a QR-coded artifact, she’s invited to share her experiences of the location and/or the artifact itself. For example, the QR code can provide access to a form with an email address and phone number and the learner can provide comments, share pictures, or leave a voicemail message describing her observations. These can later be collected to form a larger story of learner experiences. You also can involve larger groups of learners in a storytelling experience. For example, you can send one group of learners on a tour of an environment (which can be indoors or outdoors) and ask them to learn about various QR code-tagged artifacts on their way. Reading the QR codes will lead them to a blank Web page form on which they can record their observations and questions for further research. They can use their mobile cameras and microphones as part of the exercise. Upon going back to the classroom or training room, they can associate different multimedia elements with these QR code pages, creating challenges for other learners to take part in. In an alternative version of this scenario, learners can affix their own codes to artifacts and can document information or create challenges using a platform like Stickybits. An example of learner-directed storytelling using QR codes is shown in the video below by Julian Woods (@ideas_factory on Twitter). I think an important thing to remember about QR codes is that although you can use them as location-based learning objects, learning doesn’t have to be limited to that location or to a particular time period when the learner is experiencing the location. By incorporating game elements into the use of QR codes you can engage learners, making them want to come back to the learning experience at home or at the workplace for more reflection and exploration. An update: I started an open Diigo group on QR codes in learning and added my resource list to it: QR codes for learning. You do have to register with Diigo to join but that’s free. If you’re migrating from delicious, here’s a post to get you started. (It also includes a larger list of Diigo groups educators/trainers might be interested in.) I also curate a Scoop.it page on QR codes for learning.